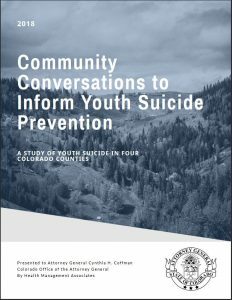 T he Colorado Attorney General’s Office just released a new report, Community Conversations to Inform Youth Suicide Prevention: A Study of Youth Suicide in Four Colorado Counties, which is now available to view online from our library. The report examines the growing rates of youth suicide in El Paso, La Plata, Mesa, and Pueblo counties, which have the state’s highest rates of teen suicide. In El Paso County alone, the number of suicide deaths in the 10-18 age group doubled from 2014 to 2017, according to the report, which analyzed statistical data as well as information from focus groups, interviews, and community feedback. Statistical data analysis was conducted from “death certificate, hospitalization and emergency department data, the Colorado Violent Death Reporting System, the Colorado Child Fatality Prevention System and the Healthy Kids Colorado Survey.” The latter three programs are all sponsored by the Colorado Dept. of Public Health and Environment, whose website includes data as well as resources on prevention.